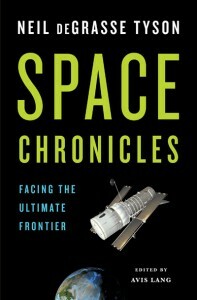 Space Chronicles is a journey from the past to the present of U.S. space exploration, with speculation about what the future may hold for NASA at the end of the Space Shuttle era. It also re-evaluates why space exploration is so important and why it demands our attention more than ever. If all this weren’t enough, it’s also incredibly funny. This book is a collection of interviews, speeches, articles and Tweets written by Neil DeGrasse Tyson, an astrophysicist and director of the Hayden Planetarium, the American Museum of Natural History. The book starts with a prologue about the role of U.S. politics rather than scientific goals, on the history of NASA, and where it stands today. Then follows three parts titled “Why”, “How” and “Why not”, referring to space exploration. Part one (“Why”) covers the reasons why humans have always felt the need to discover and explore, and why it’s more important than ever; the prospect of finding life like, or unlike, our own; the need to protect ourselves from external threats and to preserve our species; how progress is made by our continued need to discover and explore. Part two (“How”) covers the developments in technology that have allowed us to explore space, as well as technology that has enhanced our lives here on Earth as a direct result of space research. Part three (“Why not”) addresses the problems with space exploration, both technological and financial, and how these problems have lead to a disillusionment that is a terrible threat to all of the “whys” covered in part one. This book is an eye opener to early career scientists who may only just be becoming aware of the importance of politics in space exploration. Although the space race was fuelled by the need to show supremacy in the field, DeGrasse Tyson provides plenty of reasons why it is still important to continue to be curious, not only for the sake of science and politics, but for the less obvious advancements that have resulted from space research; improvements in medical technology and improved understanding of the human body; the encouragement and enthusiasm in science education thanks to the patriotism of a country synonymous with space exploration. DeGrasse Tyson’s main message from this book, and an argument against sceptics who decide that there are enough problems here on Earth to be tackled without our attention and money going into space, is that the advancements that resulted from the space race have improved our lives here on Earth more than we realise day-to-day. DeGrasse Tyson argues that NASA and the U.S. must somehow re-ignite that curiosity and passion to discover and explore, or risk losing the expertise and enthusiasm that put humans on the Moon and the Hubble telescope into space. This book is well structured and allows the reader to skip to sections of specific interest. Due to the nature of the sources of each topic, it makes an easy and casual read that is thoroughly entertaining as well as thought-provoking, and each section flows to the next very coherently, providing a complete picture of where we have been and where we are going in terms of discovery and technological advancement. The Tweets are a humorous touch as well as providing some interesting statistics. This is suitable for anyone with an interest in NASA and space exploration.